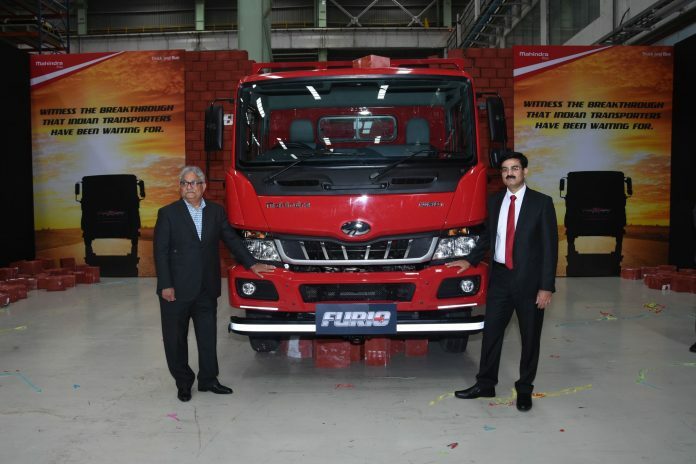 Mahindra Furio range of intermediate commercial vehicles was unveiled on 24th July. This marks Mahindra’s entry into the ICV space. With this, Mahindra has taken one more step towards becoming full range commercial vehicle player. Furio range of vehicles has been designed by Pininfarina, which Mahindra acquired some time back. Furio’s Cabin has been designed by Pininfarina. Mahindra claims to offer one of the safest, most ergonomic and comfortable cabins through this range. These ICV’s will come powered by the super-efficient, lightweight, low friction, MDI Tech engine, with FuelSmart technology. The Furio range of vehicles was tested for over 17 lakh kms across various terrains in India over more than 1,000 trials. These vehicles will be produced at Mahindra’s world class manufacturing facility at Chakan near Pune. These will be supported by service and spares network comprising of 100 3S dealerships, 149 authorized service centres, 2,900 roadside assistance points, a spares network of 1,600 retail outlets and 32 strategically located Parts Plazas. Commercial vehicle space in India is becoming extremely competitive with many international players entering it as well. With ever improving road network and ease of vehicular movement between states due to the advent of laws like GST, this space has become very lucrative for the vehicle manufacturers. Mahindra is taking a lot of steps to increase its share in a market which is heavily dominated by Tata’s currently. They have been launching many vehicles to cover all the segments of this space and the Furio will help them to up the ante further. They have already reached a number of 40,000 HCV trucks on Indian roads in a short span and are looking to move forward very aggressively. Looking at all this, we surely are ready for some fireworks in the commercial vehicle space in coming time.